Springing Into Summer At LiveWorkPlay! to live, work, and play as valued citizens! LiveWorkPlay continues to support our members to enjoy inclusive travel with Ottawa Valley Tours. A group of 9 supported by 2 staff members joined with about 35 other travelers and headed out of Ottawa by motor coach to Nashville Tennessee. Nashville proved a remarkable destination, with highlights such as the Country Music Hall of Fame, the Grand Ole Opry, and the General Jackson Showboat. But everyone agreed the highlight of the trip was spending time with everyone else on the bus, sharing special moments and making new friends. Check out this series of video clips from the trip and you'll have no trouble understanding why this was a trip that nobody in the tour group will soon forget! Chair of the Board Cecelia Taylor and her colleagues would like to remind LiveWorkPlay members and other supporters of the upcoming Annual General Meeting, which is part of the Welcome Back Family Feast on Friday, September 28. Ms. Taylor says that they greatly appreciated the patience and support of last years's AGM attendees. "With the consideration and adoption of our new vision, mission, and values it was a very busy evening," says Taylor. "For 2012 we anticipate a briefer AGM but we do have important information to share and we look forward to the opportunity to talk about progress in 2011-2012, as well as plans for the future." Please note that ecause this event involves a meal, advance registration is required. The Welcome Back Family Feast is often the first opportunity to learn about new developments at LiveWorkPlay and attendance is highly recommended for all members and their family or other key supporters. Co-Leader Julie Kingstone spent most of the month of June (and even part of July) in the spotlight thanks to the Ottawa Business Journal & Ottawa Chamber of Commerce Forty Under 40 Awards. Julie was the sole award recipient from the non-profit sector for the 2012 edition of this popular and respected awards program. "It was certainly a lot of attention and I am glad to have things back to normal, but it was also a great opportunity to highlight the work of the entire LiveWorkPlay community," said Ms. Kingstone. "I also hope that the award helped showcase the non-profit sector as a place where leadership involves risk-taking and hard work in pursuit of outcomes that might be different from the private or public sector, but are no less challenging or important to the success of our community." As part of the awards program Julie was profiled in the Ottawa Business Journal, attended a photo and video shoot, and received her award in a live presentation on June 21 at gala event with other recipients and supporters in a crowded banquet hall at the Hilton Lac Leamy Convention Centre. 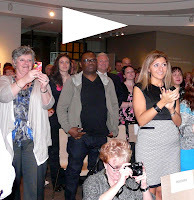 You can view live footage from the gala as well as a post-event interview on Rogers 22 Daytime television. The annual LiveWorkPlay Charity Golf Tournament has moved up to the first Tuesday in August and has also shifted to the Kanata Golf & County Club! This year's tournament will feature no less than 3 hole in one contests with opportunities to win a car or $10,000 in cash as well as a number of skill contests that come with bragging rights in addition to prizes! 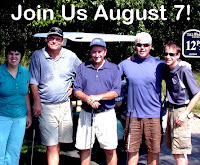 This year's tournament is ahead of schedule in terms of sponsorship contributions, but we are quite behind on golfers! Many of our regulars have yet to register and time is growing short, so please put together your foursome as soon as possible and help us have another great day of golf. Join us after for dinner, awards, and a brief live auction (all included in the $150 registration fee). LiveWorkPlay works continuously with employers across Ottawa to help identify (and sometimes create!) the right job opportunity for the right employee. We also work with community partners to help promote the employment of people with intellectual disabilities. LiveWorkPlay also networks with other employment supports providers in support of employment for individuals with all types of disabilities. The ongoing relationships with Rotary clubs in the Ottawa area and the United Way Ottawa are examples of two of the most successful partnerships with respect to connecting with employers as well as building interest and excitement about employment of people with disabilities. This is all coming together with an exciting new collaboration. 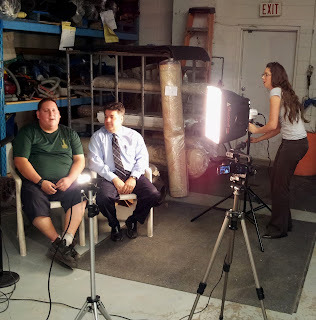 United Way Ottawa has taken footage and still photos for a new video and web campaign that will featured Rotarian and employer Vaughn McKinney from Parliament Cleaning Group with employee Jeremy Robin, a LiveWorkPlay member. As past-president of Rotary Club Ottawa South, Vaughn joined up with Ken Sparks from Rotary Club of West Ottawa as well as Jen Bosworth (Manager of Employment Supports for LiveWorkPlay and now a proud Rotarian herself!) and as a team they took a spring tour of all of the Ottawa area clubs to spread the word about the "Rotary at Work" employment initiative. With this year's focus on summer employment, Mr. McKinney stepped up and decided to lead by example. He was introduced to Jeremy Robin, and the results so far are very encouraging for all concerned. Jeremy is now into his second month of employment, and the relationship may well continue beyond the summer. "What can I say, Jeremy fits right in here" said Vaughn McKinney. "This is what can happen when you give someone a chance. Jeremy has shown that there is no end to what he can learn and his positive attitude is an asset everyone in this workplace." "Vaughn is a great guy and a great boss" said Jeremy. "It's been a very hard year with my mom and her health and it means a lot to me that I've been able to help out with this extra income. It feels great to be working and doing a good job." Watch the United Way Ottawa website for the release of the video, and also watch for a United Way of Canada campaign that may feature LiveWorkPlay member and Works Gourment Burger Bistro employee Melissa Cunningham. 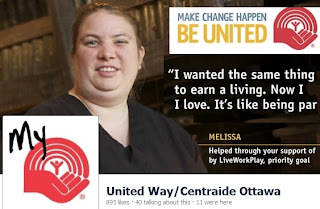 The national office contacted United Way Ottawa about her story as featured throughout 2011-2012, and Melissa gave her consent for the story to be used again. "I'm glad I have a job" said Melissa. "But I know lots of people who don't have one. I hope my story can help other people and they can get a chance like I got." Springtime at LiveWorkPlay always means event time! It started on April 12 with Recipe for Success, our annual auction and culinary adventure. More than $40,000 of net proceeds were raised thanks to generous bidders, donors, sponsors, and the energetic efforts of co-hosts Derick Fage from Rogers TV and Sandy Sharkey from 93.9 BOB FM. Special thanks to our presenting sponsor TD and their great team of volunteers! Just four days later many of those in attendance at the auction gather on April 16 at the Canadian Museum of Nature for a special LiveWorkPlay ceremony celebrating National Volunteer Week. His Excellency The Right Honourable David Johnston Governor General of Canada helped in making this a very special evening. A clear highlight (see video link, right) was honouring current volunteer and board member Pennie Styan who is now in her 15th year of service! Engines of Success is an annual celebration of LiveWorkPlay members, family, volunteers, employers, community partners, and others who help the Ottawa community welcome people with intellectual disabilities to live, work, and play as valued citizens. St. Anthony's Banquet Hall was packed with 250 guests that really got into the spirit of the June 14th evening with shouts of encouragement, applause, and even a standing ovation! There was a lot to celebrate, including a variety of award winners. Melissa Cunnhingham and Heather McAdam received Ambassador Awards for their notable efforts in advocating for the employment of people with intellectual disabilities and their involvement with United Way Ottawa efforts to draw public attention to employment issues. Robert Jarecsni and Jeremy Robin were recognized with Good Life awards in recognition of their determination to follow their dreams. Graeme Fraser and Vaughn McKinney represented Ottawa area Rotary clubs and accepted the first ever Community Ambassador Award, presented to an individual or organization that partners with LiveWorkPlay to promote the inclusion of people with intellectual disabilities. The Media Award went to Axiom News, in recognition not only of their significant coverage of LiveWorkPlay stories and issues, but also for their dedication to sharing news about people with intellectual disabilities in a way that values and respects their place in society as citizens. Last but not least, co-sponsors Wellar Consulting and young philanthropist Sneha Gupta gave out cheques of $200 each to four TOMORA (The On My Own Recgonition Award) recipients. TOMORA celebrates individuals with intellectual disabilities who move to a home of their own in the community and gives them a bit of cash to help ease the financial pressures of setting up their new living quarters! After Engines of Success comes the longstanding tradition known simply as The Pool Party. 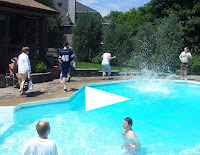 It was yet another beautiful sunny day on June 16 as everyone headed out the Harris household in Stittsville for great eats, a spirited cannonball contest, and lots of great conversation. How Do You Like Us Now? A Lot! If you have been a Facebook follower of the LiveWorkPlay page (or if you'd like to be) please "like" us again (or for the first time). The page name "LiveWorkPlay" recently became available and we remove our followers to claim it. So, we need to invite you back again! Please go to facebook.com/liveworkplayfans and click the LIKE button at the top. Be sure to invite your friends to do the same! In other news, we have upgraded our page to the new Facebook timeline format, and people really like it, as you can tell from this visual analysis! We are already back up to 450 fans! LiveWorkPlay also recently celebrated three years on Twitter! 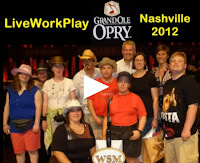 Be sure to follow us @liveworkplay! Our office is near St. Laurent Shopping Centre at 301-1223 Michael Street, K1J 7T2. Our old phone number 613-235-9550 still works and you can also call 613-702-0333. Either number will get you to our complete directory! If you like what we are doing and you can afford a financial contribution, donate online and choose from a selection of options such as a one-time contribution or monthly donation. Just $10 a month is a great help!